A Los Osos Wastewater Project contractor has sued San Luis Obispo County, demanding payment of at least $15 million dollars in damages for uncompensated construction work. In the suit, Construction firm ARB Inc. is demanding damages totaling more than 50 percent of its sewer construction contract with the county, which amounts to $26.2 million. ARB alleges that inadequate planning by the county caused its workers to undergo numerous tasks not accounted for in its contract. County officials then refused to compensate ARB for the extra work and instead threatened to withhold payment for contracted duties. Costa Mesa attorney Steven Nichols filed suit on behalf of ARB in San Luis Obispo Superior Court on February 26. “The county has repeatedly refused to pay for the additional work necessitated by differing site conditions and documented plan errors,” according to the lawsuit. ARB alleges that upon submitting change orders, or requests for compensation for extra work, the county refused to investigate the circumstances that prompted the demands. Sewer workers discovered numerous underground facilities and construction interferences not shown in contract documents, according to the lawsuit. After ARB submitted change orders, the county retaliated by threatening to withhold compensation for contractual duties if the firm did not make concessions on its claims, according to the suit. But, ARB did not concede its demands. The firm filed an official claim, which the county denied, and then sued last month for breach of contract and breach of implied warranty. ARB claims the county violated several sections of the Public Contracts Code, as well as a section of the California Government Code, by refusing to compensate the firm for the work changes. The construction firm is suing for no less than $15 million in damages, as well as for interest, penalties and attorney’s fees. The lawsuit did not specify what construction obstacles led to the work changes. Nichols did not return a call when asked what accounted for the $15 million in added costs. In March 2013, ARB workers encountered a Chumash burial ground while digging trenches in its construction area. The workers then hand-dug the area to avoid damaging human remains and Chumash artifacts. ARB likely incurred additional costs, as well, by piping water it removed from trenches to a field in the center of town in order to help replenish the aquifer. The other sewer construction contractor, W.A. Rasic, merely dumped the water it extracted into Morro Bay. Critics of the sewer project also suggest that ARB has had to pay workers considerable overtime due to poor planning by the county. The sewer project, which broke ground in late 2012, still is not complete. ARB could back out of its duties if it does not receive compensation that it demands. The county has already gone $10 million over budget on the project, and contingency funds, which are largely tapped, will not cover the damages ARB is demanding. ARB’s suit also includes 50 unnamed defendants. Some speculate the lawsuit will prompt W.A. Rasic to sue the county as well. Seemingly, “change orders” and “extra work” are the bane of all large construction projects and this one is no exception. More often than not, with a big dig project of this size the contract will be significantly modified well before the project is completed because of design flaws and unexpected barriers. down or perhaps work stoppage if they don’t get paid, thus delaying the project further. Many times the root cause is poor planning, lack of communication, or perhaps poor negotiation skills. Cheer up folks…$ 15 million divided by 5000 homeowners in the zone tacks on an additional $3000 per household . It’s only money. $15 million spent in a year averages out to just under $300,000 a week in these cost overruns, if that is where the extra cost comes from. I watched ARB put up a metal pole , backboard and basketball net on private property during work hours, who paid for that?? It seems no one is in charge of this sewer saga. and we hear Rasic might not be far behind . Complete debacle. Your county is being run by a bunch of hacks, SLO. Bingo, grc. “…run by a bunch of hacks….” Right on the nose. From certain BOS members down to the hard workers in the sewer trench………..
they come back a week later, dig up the asphalt and the dirt to place the access hatch and conduit sweep up for the CLEAN OUT which is needed at the end at the top of a run they had constructed three weeks earlier. O.K., I get it, laterals are obviously necessary and a clean out at the end is necessary, but what’s the point of not doing it all when the main trench is open and the 8 inch line was being laid? Re-digging the same job two separate times doesn’t seem like the most efficient. I’m not a rocket scientist even though I once studied briefly at Northop Institute of Technology near LAX to try to BECOME ONE, but unless there’s a nuance of wastewater collection construction that I am not aware of (not bloody likely), there is as little logic in two re-digs just as when you build a collection system and hadn’t yet broken ground on the destination treatment plant. I have seen this before and don’t think it’s uncommon. It might be just incredibly-poor planning, but I think that in a lot of cases, it’s a technique for creating more work and thus getting more money out of the local government. As a consultant to the project, I have watched the mainline and lateral digging extensively. When you have an open trench up to 20 feet deep in the center of the road that is up to four feet wide, it is impossible to dig the lateral at the same time. If you have spent any time with a backhoe, you would notice they dig, then back up and dig some more. The end of the lateral where it stubs out is at the edge of someone’s property. The backhoe can’t enter that property without tearing up all the landscaping improvements and trespassing for that matter. That is why they dig from the property line towards the main line. If the mainline trench is open, the backhoe falls into it and guess what? Bad day. Standup consultant, I should yield to your judgment, and your thinking might be correct, at least for the overall job on my street, but not for my specific lateral. You may also have more experience operating than my few dozen hours which hardly makes me a union operator, however I think it (mine) could have been done in one step due to the following differences on my run: the trench was barely 4 feet, and the lateral run barely seven or so feet in length. As you know, shoring in Calif is required past five feet (depth) and the drag shore thing sat unused down the street. Further, the sewer line was not centerline it was quite close to my side of the street, so the stretch wasn’t far and I could have dug my lateral with one setting of the hoe if it was an extenda-hoe like the 555 on which I have most of my experience. Again, this is just for my end of the line lateral. Probably WJR knows what they are doing and I’m the amateur here, but I thought the process a little strange. My specific condition would have placed the hoe about in the middle of the street. Similar depth and no shoring conditions applied for two neighbors I observed, however beyond that, things might have been different so my post was merely Monday-morning quarterbacking conducted by a comparative rank amateur. Your thinking might well have meant they did the re-dig on my entire block due to average or deeper conditions beyond what I observed on my own lateral. Still, in my own specific case, I would have at least spotted the clean out while the first dig was open. This is why they are a multi million dollar pipeline contractor and I’m just a dingbat real estate investor. But it’s fun second guessing the pros. If they later sue our town for ten mil in CO’s, my pleasant attitude WILL disappear. How will this sewer storm affect the funding for other projects within SLO County? I know of roads that are in great need of repair, yet we have enough money to fund lawyers for this nonsense? Maybe just the customers will pay the bill or has the County passed a new ordinance to allow for County Communism. Just wait when it’s up and running and the nitrates don’t go away. Then it will really hit the fan! Bingo, and you are today’s first prize winner. It never has been about the nitrates, It’s always been about compliance to Calif. Clean Water Act. And no, the nitrates won’t go away, everyone knows that, even the RWQCB. The best estimate that anyone could give was a “lessening” of the nitrate load in about 30 years after completion of the WWTF. What will happen is that a unused water source (The upper aquifer) will be deemed useable with treatment, an option that is only allowed in areas that have Wastewater Treatment facilities. Thats why Santa Maria can use their groundwater even though it has a higher nitrate loading than any of the test wells in Los Osos. The nitrate levels in the upper aquifer (remember that is an unused water source) has always been a canard. increase in benefits that they usually get. Gee, do you suppose that Celebrate Los Osos (Joyce Albright etal.) will still hold their victory party – oops, excuse me – their party for the construction workers? Note: when we bought our house from a local builder in 1985 and started to do landscaping, we found all sorts of debris underground – nails, screws, wires, boards, wallboard, etc. etc. When the sewer construction crew(ARB) started to dislodge the blacktop on our driveway, they came across what looked like an enclosed case of miscellaneous wires. The hole they had started to dig could not have been more than four inches wide when they saw this hole and stopped work. We noticed they had stopped work and were standing around. When we asked what was going on, they showed us the case of wires and told us that they would not touch it. They were waiting for PGE, telephone co., etc. to come and verify what exactly it was. I told them about all the debris we had found when landscaping and said it was probably something that the builder had shoveled over. Two hours later,, after all companies had verified it was NOT theirs, the crew continued to dig and the ‘case’ was found to be about twelve inches long – attached to nothing. Just sitting there. That is one of the problems the crews ran into. It should come as no surprise that there was a cost overrun or that there are lawsuits going on. Let’s see, when did they say the sewer would be completed? Now how about the company that got the contract to construct the actual plant? Will the treatment plant get completed with nothing to use if for? How much will their cost overrun be? This is like a serial on tv – it continues from one year to the next……….. I keep thinking about what will happen when the first big earthquake hits those underground lines. So much of Los Osos is built on top of what is essentially beach sand, and that is going to be a big problem. Once liquifaction occurs, that sewer line system is likely to come apart all over town – but then what does the County care? They don’t have to pay for the results of their stupidity. The residents do. 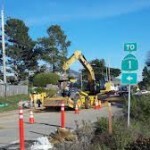 Morro Bay City Council, are you paying attention to this? You’ve turned Morro Bay into the next Los Osos. Not yet, taxpayer. That will only happen if the Council is dumb enough to partner with the County, which will undoubtedly make a mess of anything it touches. Morro Bay needs to steer clear of those characters and maintain control over its own project.